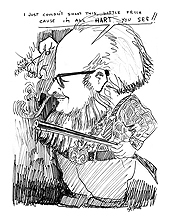 Although widely known as a printmaker, Robert R. "Bob" Auth was a prolific producer of fine art in numerous media: Acrylic painting; pen and ink illustration; lithography; calligraphy; unique media such as bone, wood, rawhide and metalwork; sculpture; watercolor painting; papier mache; engraving; etching; and pastels. The artist's works are on display in public buildings and museums, private collections throughout the world, and have been accepted by the Smithsonian in Washington, DC. Overall Dimension: 55.5 in. x 47 in. For consideration is artist Robert Auth's original "REFLECTEDDEUCE13069", returned from long-term loan where it was displayed in the Idaho Office of the Secretary of State.. 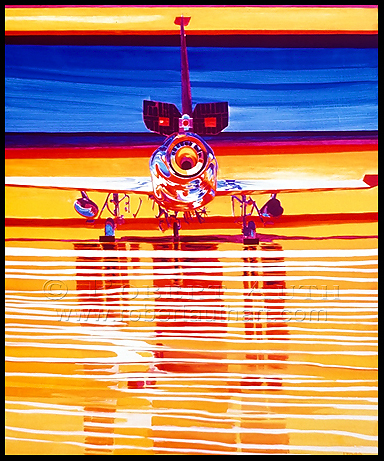 The acrylic painting exhibits the artist's penchant for bold color and abstract presentation, and depicts a stylized Convair F-102 Delta Dagger in a mirage-like setting.- Ed. For consideration is artist Robert Auth's original "BIVICTORY122770ATRIBUTETOPHIL", a unique piece in the artist's body of work and a striking display of mixed media, depth, color and boldness to achieve visceral intensity. 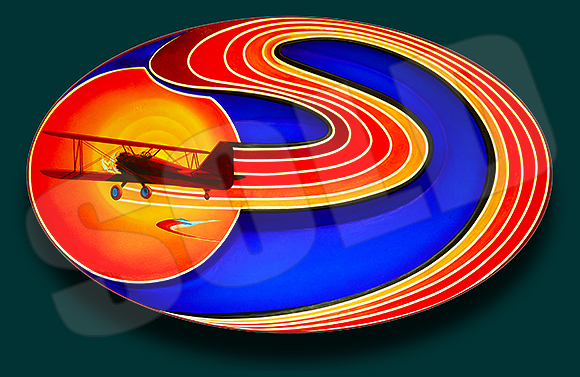 Founded on his life-long interest in aviation, the artist created this three-dimensional work as a tribute to his older brother Phil Auth, a life-long aviator who had an enduring influence on Bob and his aviation-related artworks. The painting's canvas is shaped upon wood scaffolding; the bi-plane, sun and turbulence trails are in raised relief with a recessed sky - Ed. Print Dimensions: 35 in. x 23-1/2 in. Paper Dimensions: 41-3/4 in. x 27 in. Overall Dimensions: 46 in. x 30 in. 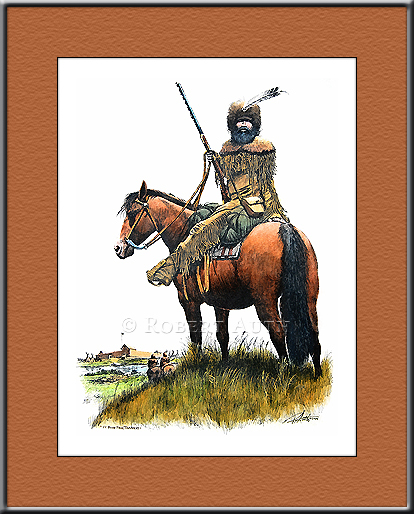 For consideration is artist Robert Auth's Proof Print of "Nez Perce War Memorial", beautifully presented in a wood frame, under glass, and ready for display. 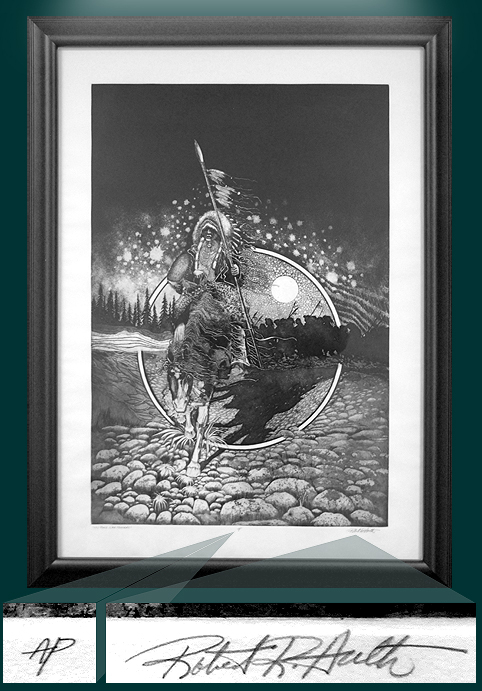 While on sabbatical in 1977, the artist collaborated with master printer Richard Royce of Santa Monica, CA in the production of this graphic tribute to the American native Nez Perce Nation. From an original copper matrix the artist produced a limited edition of 50 prints; no open editions were ever produced; however, in preparation for the limited edition, the artist produced proof prints - only two are known to exist - and one is offered here for the first time. The piece includes the title (lower-left margin); the artist's scribed signature (lower-right margin); and, the notation "A/P" (lower-center margin). The print also includes the artist's unique "chops" embossment. This is a truly rare offering, beautifully presented and a wonderful find to the discriminating collector. * - Plus shipping, handling and insurance. Painting Dimension: 17-1/4 in. x 24-3/8 in. Opening Dimension: 17 in. x 23-7/8 in. Overall Dimension:21-1/4 in. x 28-1/2 in. "Home For Christmas" offers a nostalgic look at American history through the depiction of a World War One-era scene near the state capitol building in Boise, Idaho. 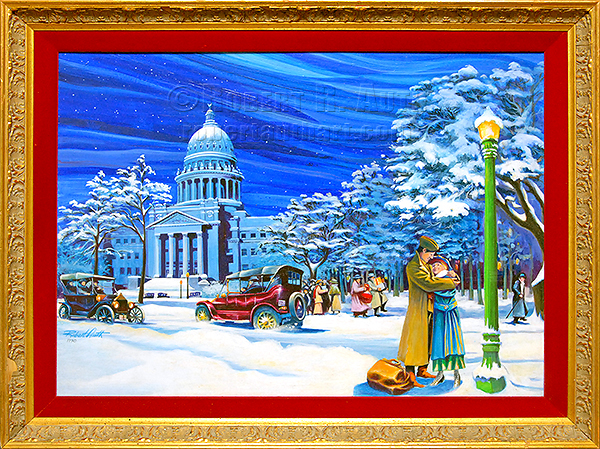 The foreground subjects - a serviceman embracing his loved one - are the keystone of this beautiful Christmas-themed oil, but also presented are the "everyday life" activities during the season: The gift-laden shoppers; carolers singing holiday songs on the People's common; Model T's traversing the scene - anchored by the capitol, relatively unchanged to this day. The soul of the piece is that quintessential juxtaposition of timely and timeless Americana. This painting was the first to serve as a basis for what eventually became a series of Christmas greeting cards the artist produced. 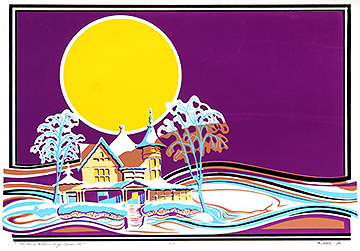 Though the medium changed through the course of many holiday seasons, the artist's general theme remained. It became his way of reminding us of our history and culture. - Ed. 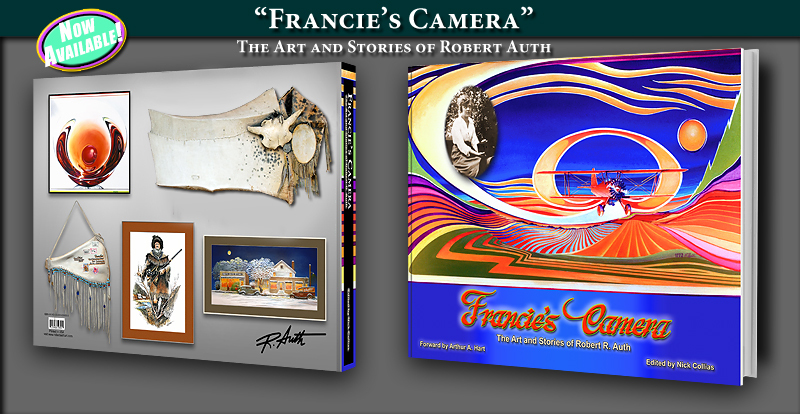 "Francie's Camera" would make an excellent gift for Father's Day! 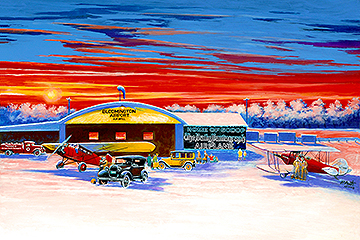 This painting depicts artist Robert Auth's nostalgic memory of the Bloomington, Illinois Airport (H.A. Will Field) circa 1930 when he was a child. 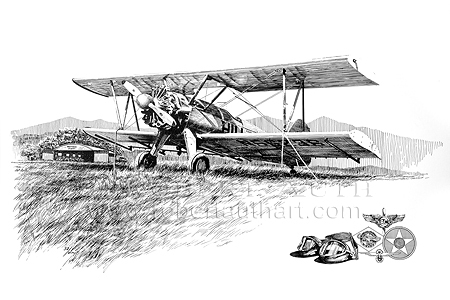 The aircraft include a 1927 Curtiss Robin (at left), and a Waco "90" biplane, known as "Scoop", the staff airplane of the Bloomington Pantagraph newspaper. "...He drafted stories under the auspices of the illustrated Christmas cards he makes and sends annually to dozens of friends and relatives nationwide. The acrylic paintings that graced the cards turned similarly illustrative, increasingly taking the form of peaceful scenes from Bob’s childhood in Illinois. Bob’s story-by-story narratives hearken, for me, to the vaguely chronological memoirs that were commonly written by Western pioneers after the turn of the century, and published by regional presses..."
Sylvan Hart aka "Buckskin Bill" Caricature (pencil; 8x10 in.) - found in the Artist's papers. 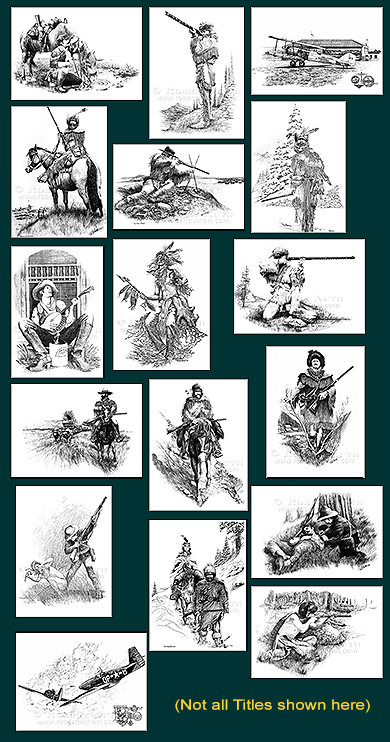 "...I followed Buckskin on his treks up and down the river for the next few days, and I made a few sketches of him before we bid him a fond farewell. It was clear that we had connected, but that connection quickly grew into a close friendship. When he came down to Boise during the school year, he’d stay at my house, or he’d come by one of my art classes, something the students loved. And after that first summer, he featured into my travel itinerary every summer for the next thirteen years, until the day when two other members of the Ee-Da-How Long Rifles and I fired muzzle-loading rifles over his casket as he was lowered into his grave in 1980..."
All original art, and displayed reproductions therof are under exclusive license. All rights reserved. Please respect it. Image files may not be copied beyond that as required for viewing on your computer. They may NOT be transmitted, e-mailed, projected, duplicated or otherwise reproduced, nor used for any purpose, alone or with other images, or transmitted or reproduced by traditional publishing methods, whether by electronic, computer or any other means, without an expressed, signed and executed licensing agreement. Copyright interests will be vigorously defended. Infringers will be notified and prosecuted to the fullest extent of the law in U.S. Federal Court; and, for any image herein which has been registered with the U.S. LOC, Copyright Office, subject to statutory damages of $150,000 PER INFRINGEMENT as well as court costs and attorneys' fees. We do not endorse any links you may find on this web site, and include them for informational purposes only. Similarly, any websites so linked do not necessarily endorse me, nor have I sought their endorsement. Neither we, nor any other providers of content on this site will be responsible or liable to you for any direct, incidental, consequential, indirect, or punitive damages that result from your access to or use of the content on this site.